I'm spending the night in one of the most incredible locations yet - at the top of the highest sea cliffs in Europe at Slieve League in County Donegal, Ireland. The drive up here was steep and at some points just a bit scary I have to say. I'm the only person up here tonight, apart from some fearless sheep. 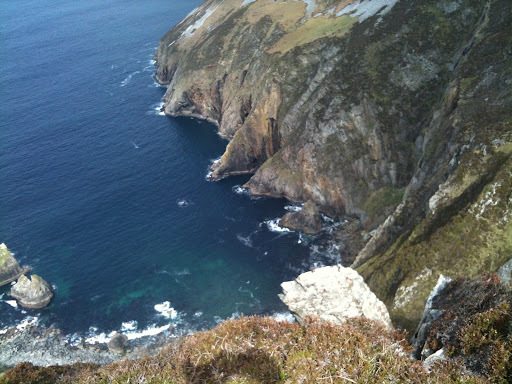 The views are spectacular - and the vista looking towards the Atlantic from this height up is like no other. Over the past few days I've been camping at Malin More and then Malin Beg, further round the coast from here. Great locations. I've been with my friends and some have come and gone during the time, making it a trip of many chapters. We've been fishing, swimming, kayaking and singing. We caught seven fish in all, mostly pollock, but had one big Colley on the barbecue on Saturday night. We dragged a kayak down the edge of the 167 steps to 'The Silver Strand' at Malin Beg to enjoy paddling around the bay. Bad weather the next day meant that I couldn't paddle to the harbour in the next bay so it had to be dragged back up again. We visited the abandoned village of Port - a 13km drive along bumpy and narrow roads to a really remote location - way out there. I explored the ruins and made it down onto the old harbour to gaze out to sea. It's been a wonderful trip and I'm looking forward to waking up tomorrow morning and having my coffee with the view from Slieve League..
Whats the scariest drive you've ever been on? Whats the most remote location you've ever spent the night in? Leave a comment.